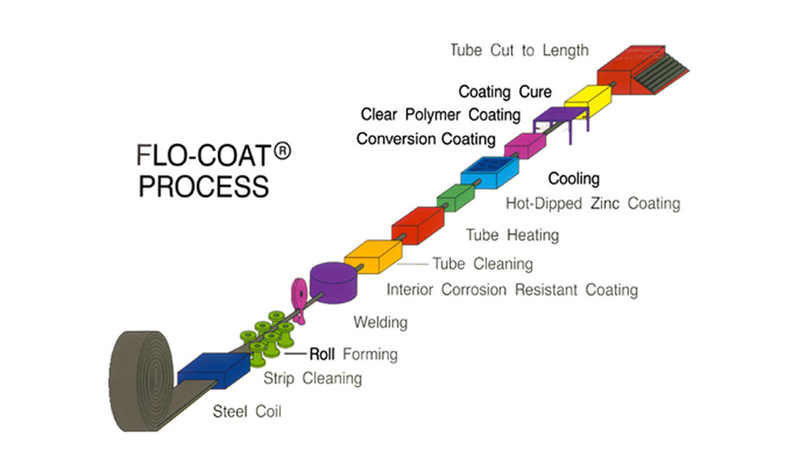 Allied's unique Flo-Coat® process is the superior method of galvanizing steel tubing. It begins with flat strip steel, which is then cold-formed and electric-resistance or induction welded. After welding, the tube receives a triple layer of protection-zinc, conversion coating, and a clear polymer top-coat - all applied in- line to assure a uniform coating. The result is a smooth, shiny end product appearance that is unmatched in terms of strength and durability. 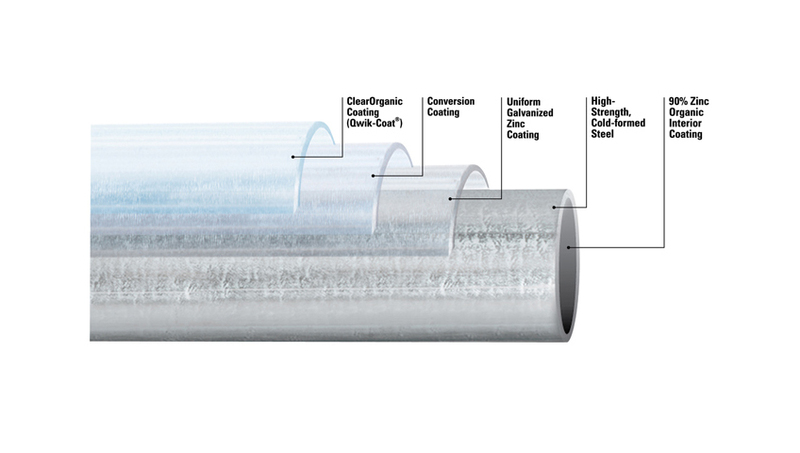 Flo-Coat® tubing exhibits greater corrosion resistance because of the synergism created between the coatings; the conversion coating passivates the zinc to slow down the white rust growth process, and the clear top-coat then "seals in" the protection. The clear third coating also acts as a primer for powder- coating. Extensive pre-cleaning is unnecessary, and excellent adhesion and abrasion characteristics are achieved, even at high baking temperatures. Tubing should be cleaned with a mild alkaline solution at 1 to 2 oz. Per gallon concentration, at 130-140°F. Dry-off should not exceed 450°F peak metal temperature. Solvent degreasers and conversion coatings will damage Flo-Coat® product. Mild phosphate or acid-based cleaners are not recommended but typically produce an acceptable result, although prolonged exposure to acid-based cleaners may damage the interior coatings. Process by which zinc wire is continuously melted and projected by compressed air onto a prepared surface. For more information, please contact your sales representative. High bake thermoset acrylic, 350°F at 15 minutes. High bake alkyd, 350°F at 15 minutes. High bake polymer, 350°F at 15 minutes. Others may require individual evaluation. * Tests independently conducted by Scientific Control Laboratories, Chicago, IL in accordance with ASTM B-117 and ASTM D-1654. Detailed Scientific Laboratories test results are readily available from your local Allied Sales Representative. Have a question about Powder Coating?